System integrator ARET, Lawo’s partner in Italy, presented at this year’s IBC a radio OB van with a brand-new concept for this category, making this truck the first of its kind. 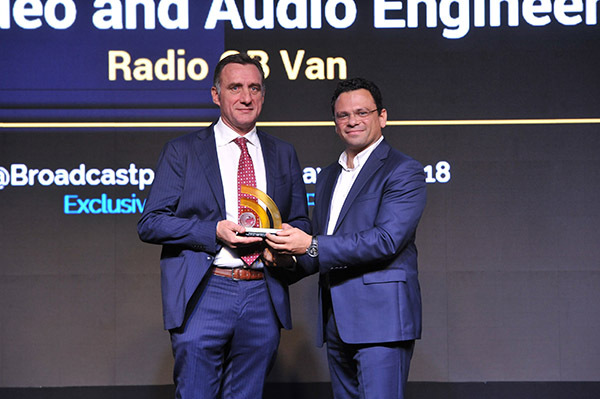 For this technologically sophisticated OB unit with Lawo IP installation, ARET recently won the “Outstanding Innovation in OB Engineering Award” of the BroadcastPro Middle East Awards 2018. The images coming from the PTZ cameras can be seen live on the 49″ monitor inside the studio that can also be used to view the signals coming from the multiviewer or the computers installed. The construction philosophy of the OB van’s radio studio is the same used in typical recording studios, realizing a “box in the box”: all the walls, ceiling, and floor are covered with unique materials, to maximize the performance. The walls and the ceiling of the technical room have the same composition, acoustic treatment and sound insulations properties such as those of the main studio. A small apparatus room in the rear, acoustically insulated from the technical area, hosts all the equipment and acts as a storage compartment. Lawo designs and manufactures pioneering network, control, audio and video technology for broadcast and post production, as well as live performance and theatrical applications. Products include control and monitoring systems, digital audio mixing consoles, routers, video processing tools as well as solutions for IP-based A/V infrastructures and routing systems. All products are developed in Germany and manufactured according to highest quality standards at the company’s headquarters in the Rhine valley town of Rastatt, Germany. For additional information, please visit the company online at www.lawo.com.